Although often perceived as a Public Servant town, Canberra is also home to a thriving private industry. Many governments have recognised the need to encourage independence from the public sector by developing local skills and industries. One of those measures was the establishment of an Apprenticeship Board in the ACT in 1936, whose role was to oversee “the welfare of the youth of the Territory and their training as tradesmen”. The work of the Board provides us with insight into the life of an apprentice in the ACT, and particularly the challenges faced by both the apprentices and the apprenticeship system before, during and after World War II. Two key sets of documents help to tell these stories. The minutes of the Board’s meetings provide a window into the Board’s work from its establishment in 1936. 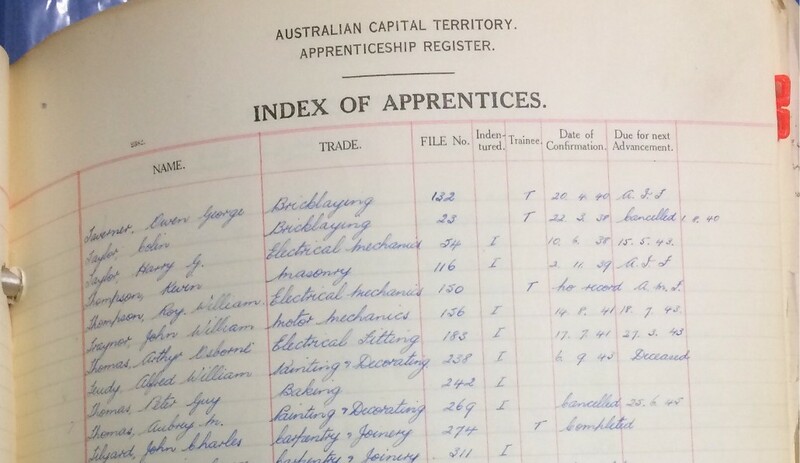 Alongside it, the ACT Apprenticeship Register was an official recordkeeping measure created in 1937 by the ACT Apprenticeship Board to help ensure compliance with the ACT Apprenticeship Ordnance of 1936. 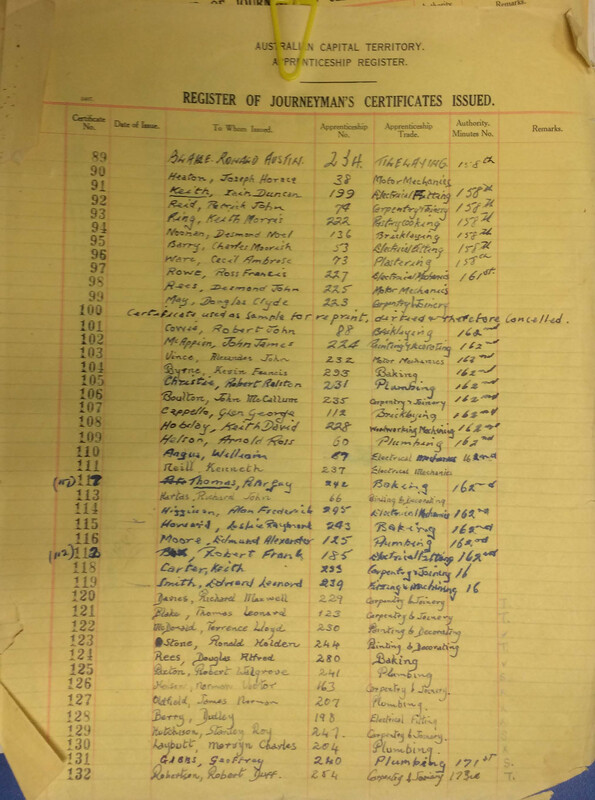 The very large, heavy and dog-eared Apprenticeship Register 1937–1968 is perhaps the epitome to some of what an archival document looks like, and it is Archives ACT’s November Find of the Month. Apprenticeships have been part of the employment landscape in Australia since the establishment of the first colony in New South Wales; however, the system remained ungoverned until the NSW Apprenticeship ACT was legislated in 1894. Several variations to the Act followed, with individual states eventually creating their own versions. In the ACT the ACT Apprenticeship Ordinance 1936 replaced the NSW Act, and was used in conjunction with the Apprenticeship Regulations to guide and support all parties involved in the apprenticeship process. 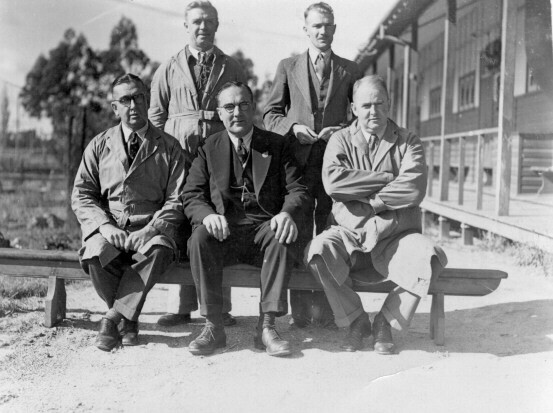 The ACT Apprenticeship Board was created in 1936 with their chief duty being described by the Minister of the Interior as “the welfare of the youth of the Territory and their training as tradesmen”. Board members consisted of industry, union and government representatives. The Board took full responsibility for every apprentice, managing their initial application and placements, supervising their education and on the job training, offering guidance and dispute resolution, and ensuring that the legislation and regulations continued to remain relevant and support apprentices in all phases of their apprenticeship. 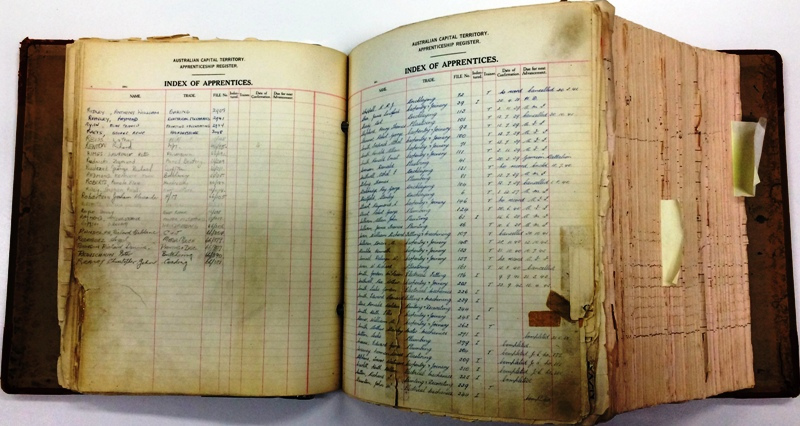 One of the Board’s first actions was to recognise the need for a ‘system of registration and recording’ and from this the Apprenticeship Register was eventually developed with the earliest recorded Apprentice listed in 1937. The information included in the Register is somewhat inconsistent over the period, containing all or part of the following fields: apprentice name and age, date of indenture, apprenticeship number, status updates including transfers and cancellations, apprenticeship or journeyman certificate numbers, academic progress and advancement confirmation, official completion dates and a list of approved local employers. 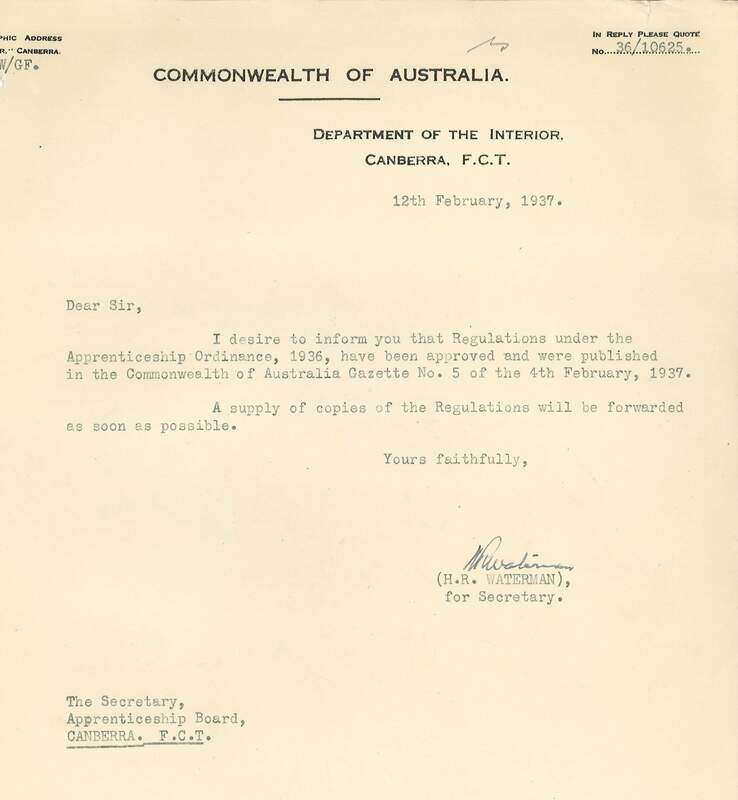 By 1938, after an agreed period of transition, all ACT Apprentices were required to be formally registered through the ACT Apprenticeship Board’s Scheme. Registration allowed the Board to guarantee minimum skill levels to employers, and this in turn was intended to guarantee the success of the whole scheme, as unskilled workers were no longer able to gain employment in skilled vocations. 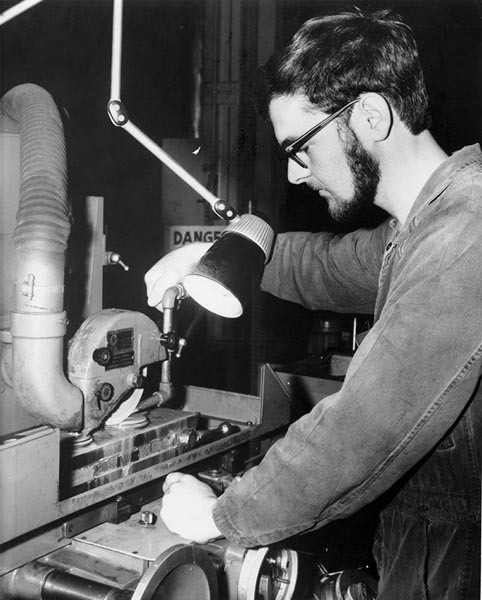 In the early days the only trades recognised by the Board were carpentry, painting, plumbing, electrical work, bricklaying, plastering, and engineering, however by the 1960’s this was to gradually grow to encompass more than forty trades. In 1936, the minimum age requirement of the apprentice was fifteen years, and this remains unchanged to this day. Apprenticeships usually lasted for a period of five years, and while apprentices paid their fees upfront, if they achieved a pass and provided evidence of attendance their employer reimbursed the apprentice the full cost. In the ACT an apprentice was expected to attend three sessions of technical schooling a week, with two of these on the apprentices’ own time (night school) and one afternoon on his employer’s time. This was relatively generous, as in many countries apprentices had to attend all three sessions at night school. Two types of apprenticeships existed, one a formal indenture between the apprentice and his master, and the second a traineeship, where an apprentice was not bound to an employer but able to move freely between multiple employers. This was particularly relevant to apprentices of the building trades, where work was intermittent and it was difficult for an employer to guarantee wages. By 1939 approximately one third of all apprentices were indentured, and this was mostly due to government placements with many of these placed within the Department of the Interior. Further to the age restriction, to be considered for the ACT Apprenticeship Scheme applicants had to meet minimum academic requirements. In 1936 the academic minimum required was: evidence of a primary school certificate, two years of high school and one further year of study at the Canberra Technical College. The Canberra Technical College began in 1928 and was originally located within the grounds of the Telopea Park School, and after many location and name changes, it still exists today as the Canberra Institute of Technology (CIT). Although the Board set the academic bar quite high, it also recognised that these conditions were sometimes unachievable, particularly post the Depression, and it catered for this by allowing students to apply for consideration under special circumstances. These students were given additional scholastic support and mentoring to help them catch up to their cohorts. Meeting the scholastic requirements of the scheme was, however, no guarantee of a placement. The maximum number of apprentices allowed per trade was carefully calculated every year to ensure that there were sufficient placements and work available in each industry. It was not unusual for an apprentice to be offered an alternate type of apprenticeship or to miss out altogether. Once an agreement had been put in place an apprentice was expected to work up to 45 hours per week. A first year apprentice could expect to earn a mere 15% of a journeyman’s wage, and this increased every year to a maximum of 60% in the fifth year. Apprentices scoring over 75% in their final exam were rewarded with a small 2.5% bonus on their base wage the following year. First years were not allowed to work overtime, and with family commitments and night school the first year of an apprenticeship was quite difficult. The Board minutes show that considerable time was put into managing young apprentices struggling to meet their commitments, and often requested that their families be interviewed to discuss the situation. Now the responsibility of the employer, apprentices were given tasks suitable to learning their trade. Supervision of a first year apprentice was quite time consuming. There was a clear delineation regarding suitable tasks and penalties applied to employers who did not adhere to the agreed terms in the Ordinance. Employers were expected to hire building labourers to undertake manual tasks, but labourers earned significantly more than apprentices and the Board often heard complaints regarding apprentices losing training time to undertake manual labour tasks. One example of this was a joint complaint made in October 1944 by the plumbing apprentices employed by the Department of the Interior. The Board investigated their complaints that they were expected to undertake manual labour such as digging ditches and found in favour of the apprentices, issuing a formal warning to the Minister and instruction that ‘the practice of requiring apprentices to such labouring work cease forthwith’. Further to the enlistment issues, as of the 1 October 1940 there was also the requirement for all unmarried men turning 21 to attend three months of militia training. This interruption to the apprenticeship training caused problems with classroom attendance, exam failure, sickness and exhaustion. The Board instituted some changes to help apprentices achieve passing results including accepting sick leave, providing additional tutoring, and even waiving attendance rates. Apprentices undertaking military training at Dapto were sent to take exams at Wollongong, however, the nature of the training was such that the exam results were affected and exams needed to be repeated anyway. Debate also raged between employers, the Military and the Board over the rights of the returning apprentices versus the need to continue employment in their absence. By mid 1940 the rights to return home to their trade of apprentices who were enlisting was protected, and this legislation, in conjunction with the enforced employment limits, meant that employers were often forced to choose between the temporary replacements and the returning apprentices. The agreement to support returning servicemen made for a time-consuming process as up until 1941 each case had to be treated separately. Difficulties faced by the Board included: receiving accurate records from the Armed Services; agreeing on how much time in service equalled reductions in indenture; arranging for additional testing to check progress, and comparing trade skills for apprentices that may have worked in a different trade whilst serving. The board clearly documented their empathy for returned apprentices but in many cases they lacked the evidence to adjust training requirements. In recognition of these difficulties, the Commonwealth Reconstruction Training Scheme was introduced in March 1944 and this supported returning serviceman by fast tracking either their education or training to enable better integration on their return. There were also some monetary concessions made with returning apprentices receiving slightly higher apprenticeship rates. This Scheme was highly successful and on its completion in 1954 it boasted an enrollment of over 300,000 veterans. While the situation improved for enlisted apprentices, there were ongoing problems for local businesses as they juggled the fluctuations to their staffing and were forced to make decisions regarding employment for temporary staff they had employed. The Board was often called on to make final decisions and most of these workers, including some women, worked under informal arrangements and were summarily dismissed without either employment or educational recognition. Wartime also affected the amount of work available, and it was not unusual for apprentices to be forced to take up other opportunities until work became available in their trade. Peter Guy Thomas was a baking apprentice who was formally indentured to Messrs Rowan and Meyer in 1943 for a period of five years. 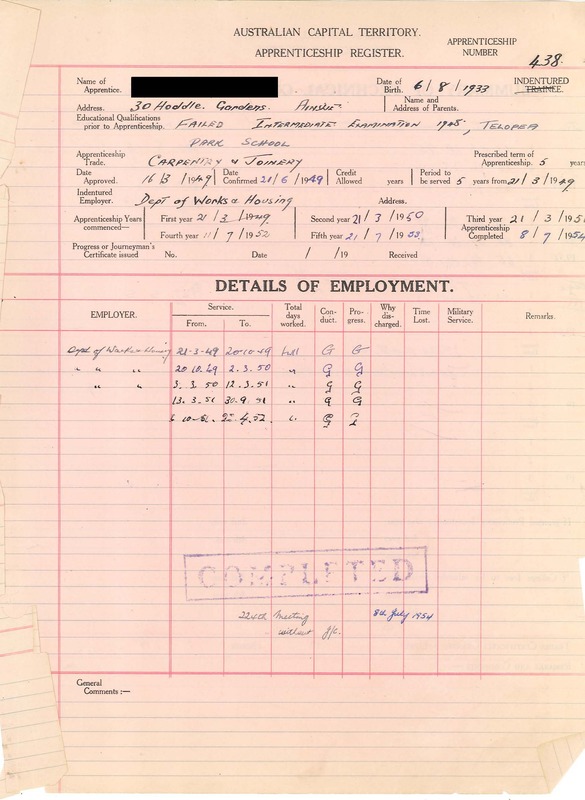 Of all the stories waiting to be found in the pages of the Apprenticeship Register, Thomas’ story offers real insight into the life of a Canberran apprentice, their employment and the actions of the Apprenticeship Board in the early 1940s. Thomas started working informally for Rowan and Meyer in 1943, and after a period of seven months he chose to represent himself to the Board to apply for consideration as a Bakers Apprentice. Upon consideration of his plea and agreement by his employer the Board approved his request and even backdated his apprenticeship by the seven months he had already worked. In September of 1944, the Board received a letter from Mr Rowan, of Rowan and Meyer, requesting the cancellation of their Indenture. 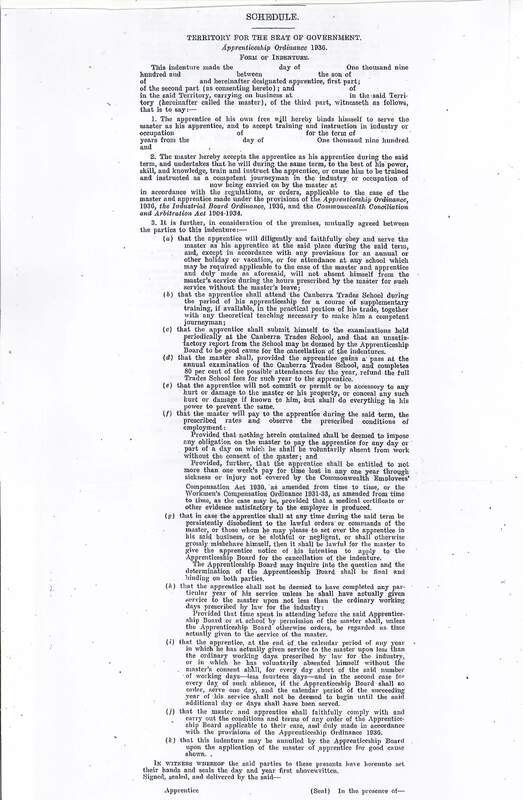 Rather than grant the request the Board decided to investigate the issue under the Ordnance Act and initially arranged for Mr Rowan and Thomas to attend the Board to discuss their issues. This process was well documented by the Board over a period of more than a year with many witnesses called on behalf of all parties. Mr Rowan initially stated that “Thomas did not seem to be adapted to the trade, he did not appear to be interested in his work and that he appeared to resent being given instructions”. He claimed to have attempted to reach out to Thomas’ father, who had instead thrown his support behind Thomas, and this led him to believe that Thomas’ father was unaware of the full extent of the problems. He went on to discuss Thomas’ conduct, which he described as abusive, his diminished educational results, and their continuing disagreements over baking tasks. Mr Rowan felt that Thomas was disinterested in the trade and he looked forward to hiring another apprentice with whom he could share his knowledge. When questioned, Mr Rowan did admit to asking the apprentice to undertake other tasks but insisted that he had paid him fairly at times to compensate and had given him an old horse for his own. He considered that these other tasks would only advantage Thomas in his trade so were therefore justifiable. Thomas claimed that he was repeatedly asked to perform tasks outside of his employment, including manual labour such as: packing the wagon, making deliveries, and caring for the horse and carriage. This work was costing him roughly 18 hours a week in additional labour, and with deliveries, he often worked up to 18 hours a day. He felt that this time disadvantaged him in learning his trade, and that he had not been paid fully for his additional duties. He claimed that since the Board had raised wages Mr Rowan’s attitude towards him had changed, with Mr Rowan stating that “he was paid manager’s wages”. He claimed that Mr Rowan was a great ‘man for the drink’ and that this caused him to be somewhat irritable in the mornings. He confessed that he had put his fists up to Mr Rowan after he had insulted his father, but that in the main their arguments were regarding different approaches to baking, with his two employers teaching him different techniques. Thomas said he felt stuck between them, never able to please one or the other. In regards to his education, Thomas claimed to have missed classes only because his mother had been in hospital, and pointed out that his grades were otherwise acceptable. When questioned on his commitment to his trade, Thomas stood his ground and insisted that he was interested and committed in his apprenticeship. Unable to make a decision, the Board spent some months calling in other parties, and it is perhaps telling that during this period Thomas continued to work, and was even promoted to become a 2nd year apprentice. When called before the Board, Thomas’ father insisted that Thomas was committed to becoming a baker. He described Thomas’ apprenticeship training as ineffectual, stating that he felt Thomas was being used more as “a useful or roustabout”. He believed that Mr Meyer was well aware of this as he had been teaching Thomas privately after hours without the knowledge of Mr Rowan. As this additional training was unpaid and resulted in Thomas working long hours, he had no choice but to insist that the arrangement end. He believed Thomas worked quite well with Mr Meyer, but felt that Thomas would never learn from his current master as the relationship was too strained. He requested that Thomas be given the opportunity to shift his indenture to a new employer if one was amenable to the transfer. Mr Meyer’s testimony was that he “was more of a cobber with the boy than an employer”, but that he had witnessed issues between Mr Rowan and Thomas, including one where Thomas had used bad language. Mr Meyer had often switched roles with the lad to give him some space from Mr Rowan in the kitchen. He also suggested that Thomas may enjoy changing trades to work with horses, as he seemed ‘a natural’ when handling the Bakery’s delivery animal. Although he felt he had more to share with Thomas as his master, he echoed the sentiment of Thomas’ father that Thomas would “not do any good at his trade under the present arrangement”. This matter appeared unresolved for some time, with Thomas’ name eventually being raised again in the final minutes of 1944. The Board noted that he appeared to be working for a new baker but that approval had not been sought for the transfer. It would perhaps have been easy for the Board to ignore Thomas at this point, however, it seems his tenacity paid off as the Board suggests that a letter should be written to Thomas’ father to seek confirmation of the transfer and to update his details in the Apprenticeship Register. Although it would be easy to write Thomas off as an argumentative and difficult young man, some further research has shown us that he did indeed succeed in achieving his journeyman’s certificate and in 1946 he was truly vindicated when he won the ACT Baking Apprentice of the Year. The ACT Apprenticeship Register and the minutes of the Apprenticeship Board are publicly available archives. If you have a particular question about the Register and the Minutes please contact ArchivesACT through our “Request a Record” service. If you would like to view the original documents you can also contact us to arrange a suitable time to visit the Archives ACT Reading Room located on the top floor of the Woden Library. Minutes of Meetings 4/8/1936-4/12/1944 (Vol. 1) / ACT Apprenticeship Board, Canberra: [Government Printer], 1945.